These meatballs are amazing, served on their own, contrary to how we Americans view our meatballs. Actually, traditionally Italian meatballs (called polpette) are served separately from any pasta, except in some southern Italian provinces. Arranging them on a heap of pasta, swimming in sauce, was a new world creation. In any case, here is an awesome meatball recipe, and you can plate them however you prefer! Simmering any kind of meat in tomato sauce will give the sauce the full bodied richness we’ve come to love. Traditional Italian cooks have many favorite variations, using slow-simmered tomato sauce with meat added to give the sauce a specific richness of flavor. Often and additional meat variety, like pork or steak, adds special flavor to the dish. 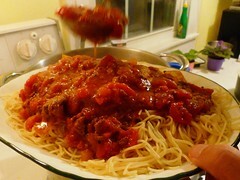 When served, the sauce is on the pasta with meatballs served separately, on the side. This recipe will be only for the meatballs, but you may want to add another meat to your flavor. Cut them into chunky bits, browning it in olive oil before blending into your sauce along with the meatballs. This recipe produces moist and tender meatballs, with a wonderfully flavored sauce. What makes them different? These meatballs are prepared with medium-fat ground beef. Don’t make use of lean ground beef because the fat provides added flavor. The sauce is lightly seasoned. Simple ingredients allow the tomato flavors reveal themselves. You’ll want to use salt and pepper, if nothing else. You can get this sauce ready beforehand, however leave the meatballs in the sauce, rewarming slowly when you’re ready. You can of course serve these meatballs on pasta if you choose, or mix the sauce with your favorite pasta and offer the meatballs on the side. However you choose to serve these meatballs, you’ll love this recipe. Heat up the oil over medium heat, add the garlic, onion, and saute until tender. Add the paste, tomatoes, water and herbs, and bring to a boil, then salt and also pepper to your personal taste. Shape into golf ball sized balls, and carefully drop right into the simmering sauce. Do not stir for the first 15 minutes,until the meatballs start to firm up. Cook for 1 1/2 to 2 hrs over low heat, stirring periodically, adding additional water as required,if the sauce starts tothicken more than you would like. This sauce, with or without the meatballs,can now be served over your favored pasta. Prior to serving, stir the 3 tbsp of grated cheese right into the sauce.